Imagine the hit of hot wind blowing on your face as your jeep rattles over rugged red earth in a wily, sparse landscape. A mirage of dots in the distance come into focus – wild animals elegantly moving as one. This is your ultimate safari in Africa. This is the Great Migration. The Great Migration takes place during the months of August to September each year, at a time when animals are on the move to secure their survival, eating the tall green and golden grasses of the savanna in the Masai Mara in Kenya and the Serengeti in Tanzania. Where you place yourself during your trip to Africa will influence how close you can be to the activity of the famous Great Migration. 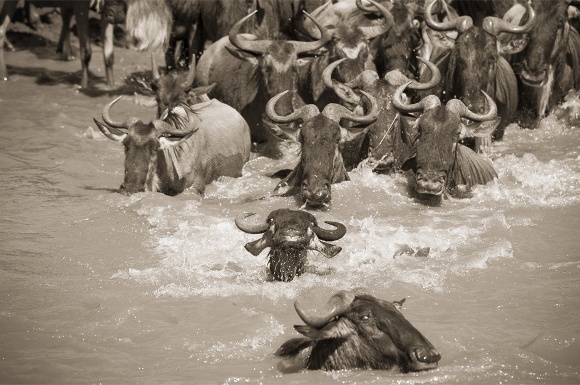 If you’re lucky, you can find yourself in the throngs of hundreds of thousands of wildebeest, zebras and gazelles as they venture towards water. Gear up for your personal wildlife adventure! 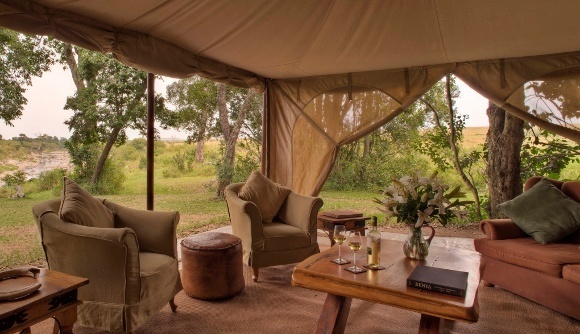 Enchanting Travels recommends its top five camps for experiencing personal African wildlife encounters during this majestic season. The filming location of the Walt Disney movie, African Cats, Rekero Camp is a wonderful tented camp tucked in the heart of the Masai Mara. Close to both the Mara and Talek rivers, you can view the annual migration crossings whilst relaxing in the comfort of your armchair at the camp. This is a very intimate camp with just nine private tents that all have en suite bathrooms with bucket showers and flush toilets. Being an un-fenced camp, it’s quite possible that elephants, hippos and even leopards wander among the tents. There are also a few resident wild animals who share this gorgeous location, including an elderly male buffalo that is the camp’s own adopted guard and known warmly by the camp crew as “The Brigadier”. 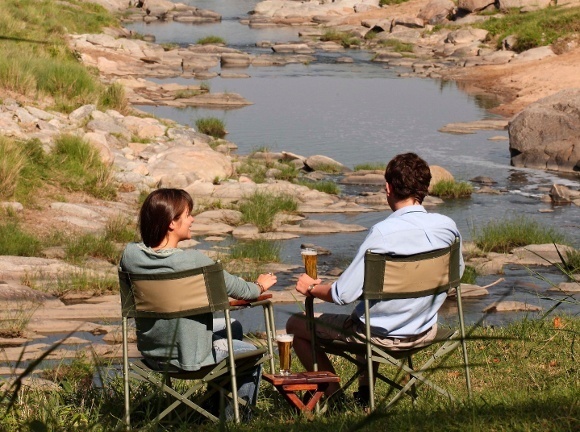 By day you can enjoy picnics in the bush and sundowner drinks along the beautiful river bank, or for something a little extra special you can experience a dawn flight in a hot air balloon. By night farmhouse dinners are there to be relished under the stars. Set on the Mara River, right at a common crossing point of wildebeest and zebra, Entim Camp in the Masai Mara is an incredible game-viewing area. There’s no need to drive hours to get to the wildlife action, nor does your wild experience need to stop at dusk like a lot of African camps. 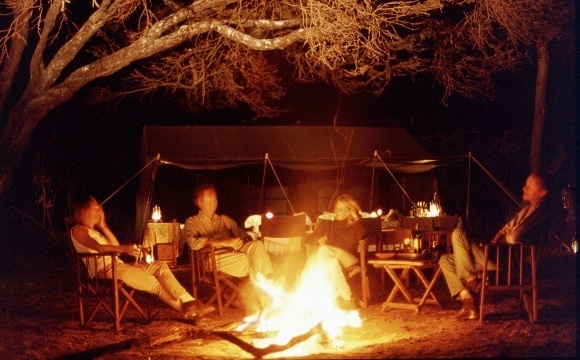 In fact, you can just sit on the verandah of your tent and observe the many magnificent animals that pass before you with a glass of wine sourced from the famous wineries of South Africa along with a freshly baked pastry or two! Again there are just ten tents to enjoy, each with their own unique furnishings. The lounge area boasts a small library, a bar and dining area. 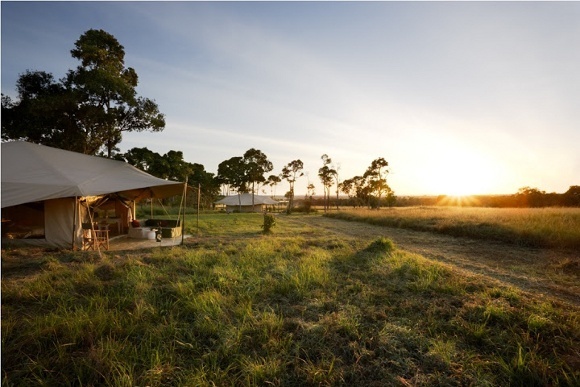 The camp is sited within a forest area but you have the vast distances stretching out across expansive plains through to the ethereal sunlit mirage of undulating hills escarpments. Enjoy thirst-quenching sundowners with an utterly delightful 360 degree panoramic view. If you’d like to be in the closest camp to the Mara River during the Great Migration season (July to October) then there’s only one canvas camp for you: Olakira Camp in the Serengeti has views of several crossing points across this famous river. 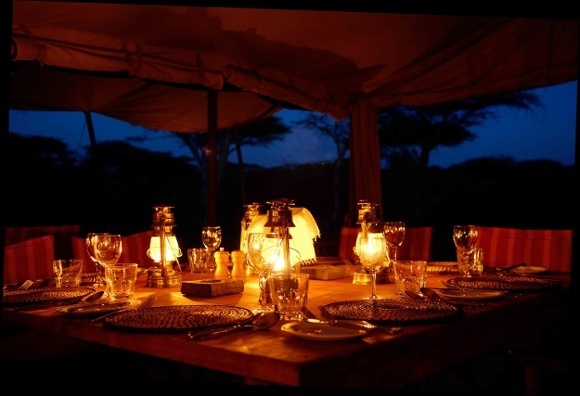 An intimate mobile luxury camp of eight spacious tents, for the first part of the year it is situated in a perfect position for guests to witness the captivating calving of wildebeest in Ndutu within the Ngorongoro Crater Conservation Area. By July however when the lands are drier the camp follows the herds and moves to get the ultimate front row seat in the unspoilt Northern Serengeti alongside the hippos and crocodiles of the Mara River. This mobile camp is a very timeless experience. You can also receive an exclusive opportunity to explore the idyllic hideaway of the Bolongonja bush. The stunning Sayari Camp within remote and tranquil northern Serengeti, is also near to the Mara River and promises an exquisitely wonderful wild animal experience. One of the highlights of Sayari is the guided walking safaris that allow you to experience all the secrets of this region from an expert naturalist. Sayari has 15 tents that even have bath tubs in the en suites! There’s a separate mess and dining area, an infinity pool, a warming fireplace and your own private verandahs for relaxation. When you’re not wildlife-watching, you can unwind in nature with a soothing massage. 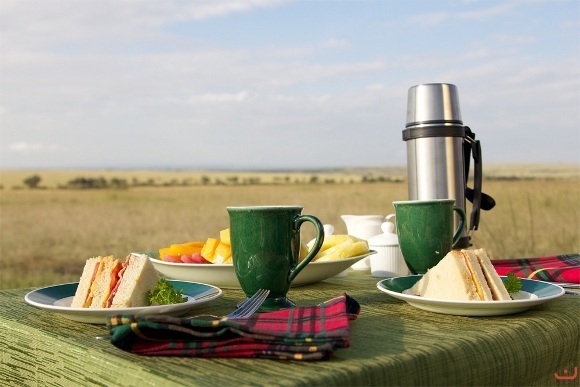 For an ultimate wilderness experience of the Serengeti combine your time at Olakira Camp with Sayari Camp so that you can enjoy the gorgeous walking safari between the two. Pursue the packs of wildebeest and zebras in a totally authentic safari camp that moves with the migration. Serengeti Safari Camp covers hundreds of miles mirroring the route of the animals and was the first camp of its kind to do this. In fact, it has 20 years experiences of intimately studying the herd movements. With six en suite tents, all guests here have their own exclusive vehicle and guide so that your day is completely your own, enjoying it at your own pace, whether it’s an early morning game drive or a leisurely lunch at the camp. 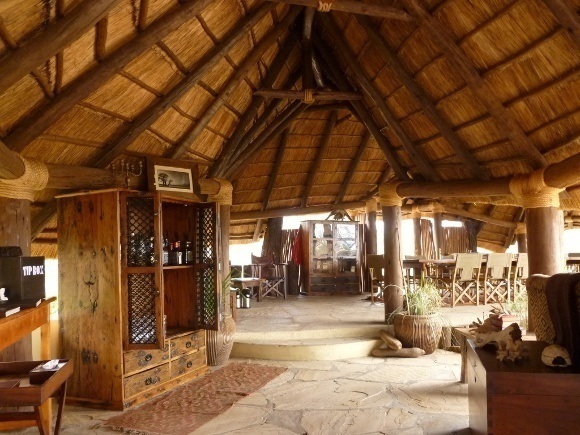 This is a luxurious home from home for your travels in Tanzania. Read more about the Migration Magic with wild highlights from Florian Keller, Managing Director of Enchanting Travels. You can also enjoy his short Great Migration video below. Design your ultimate Great Migration safari with Enchanting Travels today and receive more obligation-free top tips from our destination experts.